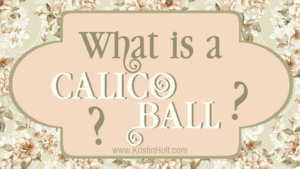 Don’t miss my recent post– What is a Calico Ball? 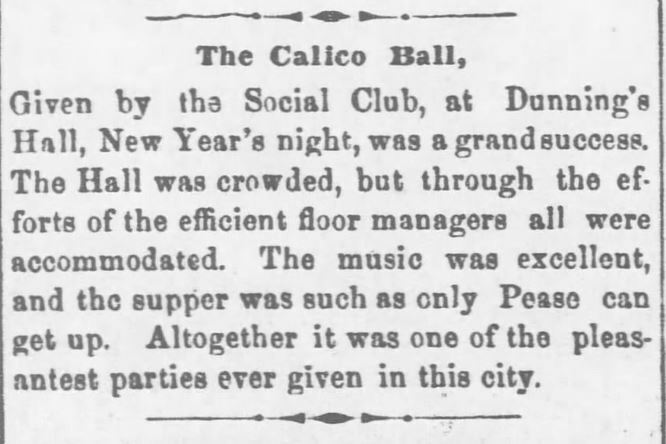 Calico Ball in St. Louis. The Louisville Daily Courier of Louisville, Kentucky on January 25, 1855. The Times-Picayune of New Orleans, Louisiana on January 28, 1855. 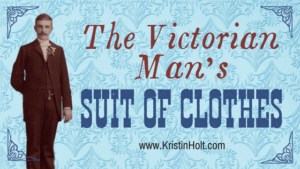 ~ (transcribed with care, including all spelling and punctuation) Nashville Union and American of Nashville, Tennessee on August 24, 1858. 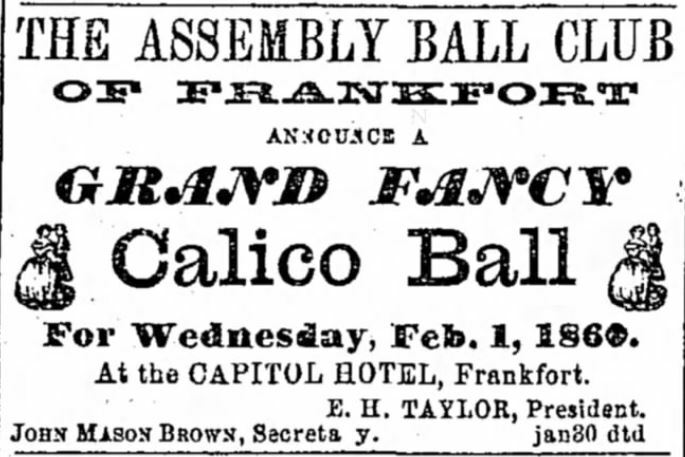 The Assembly Ball Club of Frankfort Announce a Grand Fancy Calico Ball for Wednesday, Feb. 1, 1860. At the CAPITOL HOTEL, Frankfort. E.H. Taylor, President. John Mason Brown, Secretary. Published in The Louisville Daily Courier of Louisville, Kentucky on January 30, 1860. 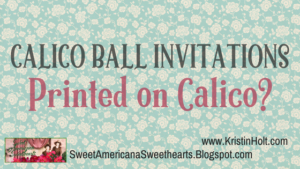 Calico Ball in the West, to appear as washday-ish as possible. The Emporia Weekly News of Emporia, Kansas on February 4, 1860. 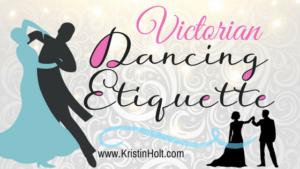 “A Universally Popular Affair” – Dresses to be left in the dressing room after the event. 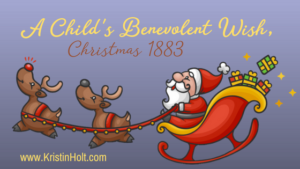 Published in National Republican of Washington, District of Columbia on January 23, 1861. 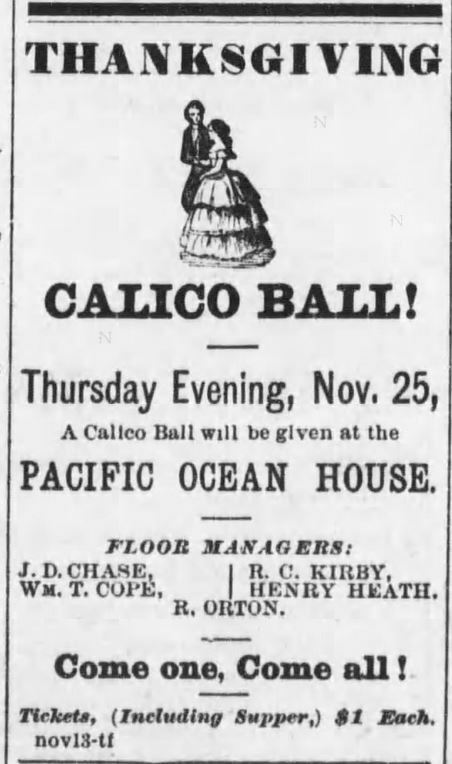 The Calico ball at Odd Fellows’ Hall, announced in The Leavenworth Times of Leavenworth, Kansas on March 26, 1869. 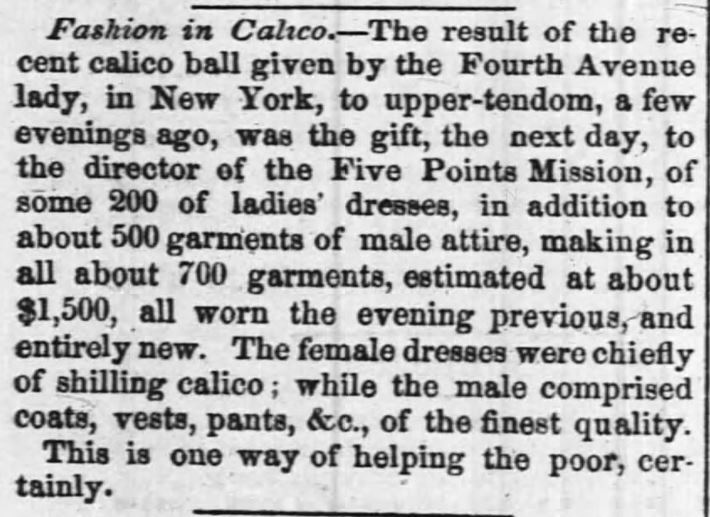 GRAND CALICO BALL.–Palmer & Darr give a ball at McDonald Hall on Friday evening next, the proceeds of which, after paying expenses, will be distributed among the needy and poor of this city, by Capt. Dan Young, of the police force. The members of the Band attached to the Wilder House render their services on this occasion gratuitously. Tickets only $1.00 for the above worthy object, to be had at the Wilder House. ~ Fort Scott Daily Monitor of Fort Scott, Kansas on January 5, 1870. 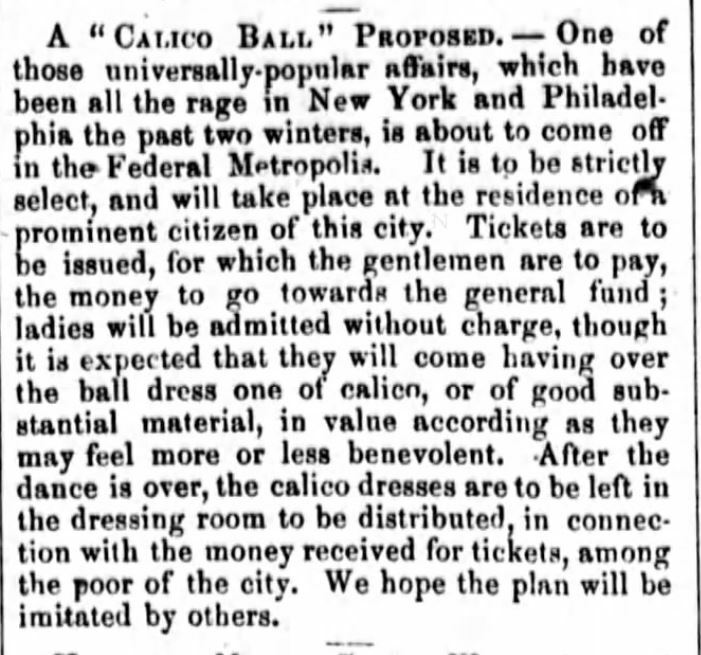 The calico ball of the Young Men’s Club, reported in The Leavenworth Times of Leavenworth, Kansas on November 11, 1870. 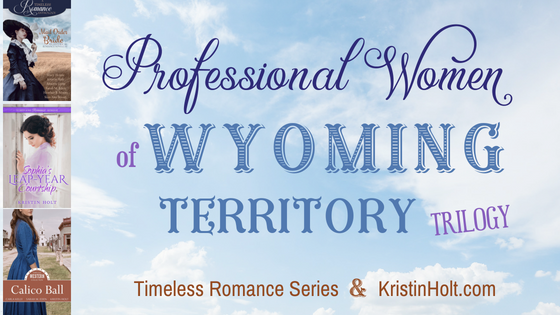 The New North-West of Deer Lodge, Montana on January 20, 1871. Lawrence Daily Journal of Lawrence, Kansas on January 20, 1872. 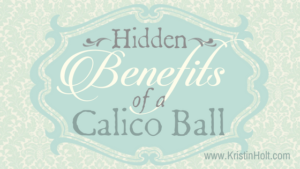 The Calico Ball, given by the Social Club. Wyandotte Gazette of Kansas City, Kansas, on January 2, 1874. 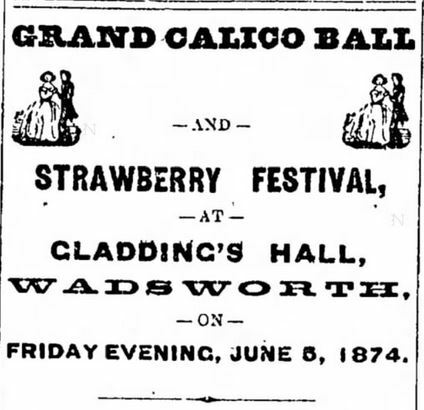 Grand Calico Ball and Strawberry Festival. Nevada State Journal of Reno, Nevada, on May 29, 1874. Thanksgiving Calico Ball! Santa Cruz Weekly Sentinel of Santa Cruz, California on November 20, 1875. 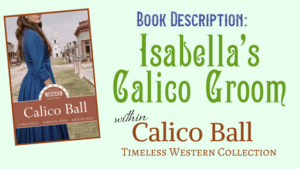 Leap-Year Calico Ball. 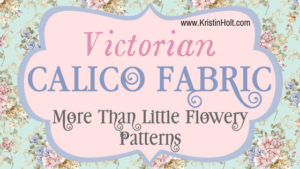 Reading Times of Reading, Pennsylvania on February 29, 1876. 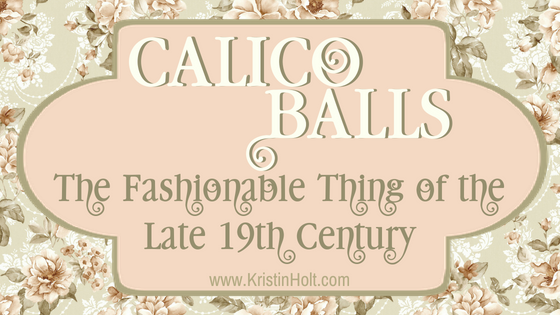 Good Templars’ Calico Ball announced in Rocky Mountain Husbandman of Diamond, Montana on November 9, 1876. Mesdames, Marvin, W.H. 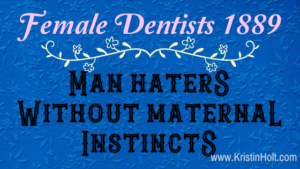 Shupp, W.A. Givens, John Speers, Overhuls, M. Hise, Kohn, Scott Moore, Clancy, John Mills. Misses Idy Wiley, Julia McKay, Fannie Rosenthal, Carrie Stoops, Miss Carpenter, Jessie Hubbell, Belle Kohn, Fannie Herbert. (transcribed from a digital scan of the newspaper article. Whether of poor quality to begin with, or the ink lost with age, the scan is difficult to read, so I provided a carefully transcribed, word-for-word, with care taken to preserve historic punctuation, spelling, formatting, and the like.